With new, advanced terrain opened in the 14/15 season, Sun Peaks Resort is now the second largest ski area in Canada. Sun Peaks is located in the interior of British Columbia, Canada. Located in the interior of British Columbia, a region famous for it's snow conditions. Sun Peaks is just 45 minutes north of Kamloops, under three hours from Kelowna and only four hours from Vancouver. Daily direct flights through Kamloops Airport and Kelowna Airport make it easy for guest to arrive at the resort. Additionally, Sun Peaks offers weekend non-stop service from both Los Angeles (LAX) and San Francisco (SFO). Other hub cities include Seattle, Vancouver and Calgary. Note--The LAX return flight is a change of plane. Base elevation of 4,116 ft. with vertical 2,894 ft.
Once in Sun Peaks you’ll experience the light, dry, easy to ski powder that only the interior of British Columbia can provide. Annual snowfall at the resort is over 240 inches. Sun Peaks is known for its consistent snow quality and conditions receiving fresh snow regularly, ensuring every guest has fresh tracks regardless of the date of travel. Sun Peaks offers terrain for all levels with 10% of the slopes set aside for beginner, 58% for intermediates and 32% of the slopes are advanced or black diamond runs. Due to the sheer size of the terrain spread across three inter-connected mountain, it is highly recommended you join a complimentary mountain tour departing the Village Day Lodge at 9:15 am or 1:00 pm. These tours are run by long time locals who are thrilled to be sharing their piece of heaven with guests from around he world. Groups are based on ability and the tour generally run about two hours. If you are new or want a refresher course on the mountain, Sun Peaks offers complementary mountain tours. Tours are operated daily and are open to all levels. For the snowboarder or extreme skier Sun Peaks offers a "progressive" terrain park of over 435,600 square feet that runs top to bottom on the Sundance run. Included in this park is a variety of jumps, boxes, and rails. In addition to skiing and snowboarding, Sun Peaks offers family fun at their on-mountain tubing hill. Off mountain activities include dog sledding, horse back riding, snowmobiling, sleight rides and more. Sun Peaks was designed for one purpose only--skiing! The master development plan was laid out over 20 years ago with an emphasis on environmental stewardship. Sun Peaks’ three peaks circle the Village for a unique 360 degrees layout, making it extremely convenient to pop back into the village and back out to the slopes. 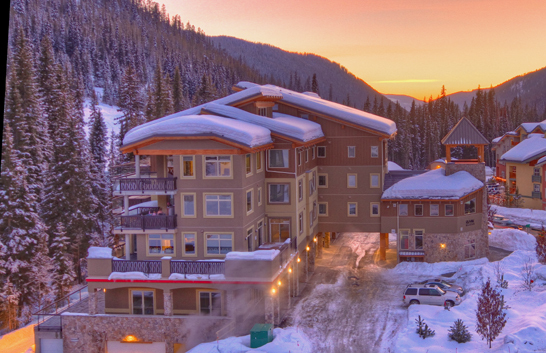 Sun Peaks has taken the concept of ski in, ski out a step further with a ski through village. In addition to and outdoor ice rink, Sun Peaks Village offers 22 passionate restaurateurs from around the world offering an exceptional diverse culinary opportunities. These dining opportunities range from sushi to polpette and even authentic German schnitzel The village offers 20+ shopping opportunities starting with traditional ski shops, but also includes Rocky Mountain Chocolate Factory and even a Helly Hansen and North Face outlet. As mentioned earlier, Sun Peaks is a ski though village. 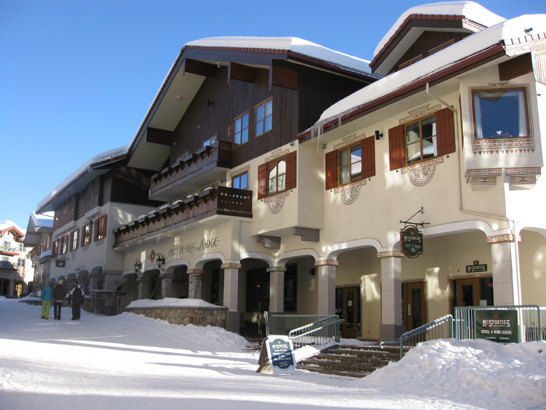 Virtually all lodging options allow you to ski up to your door. The village walkway/ski way is surrounded by eight unique properties. 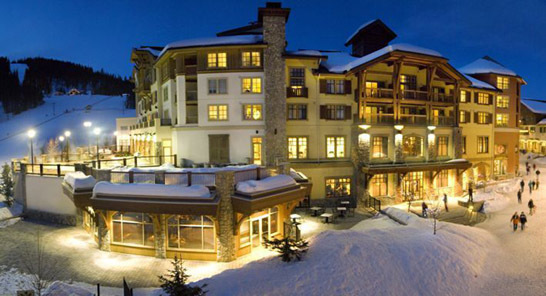 These properties include the Coast Sundance Lodge, Hearthstone Lodge, Sun Peaks Lodge, Kookaburra Lodge, Fireside Lodge, Nancy Greene's Cahilty Lodge, Sun Peaks Grand Hotel and Residence at Sun Peaks Grand. In addition to lodging opportunities in the village, outside the village a number of condo properties exist offering larger units and private hot tubs which are either a short walk or a car is recommended.